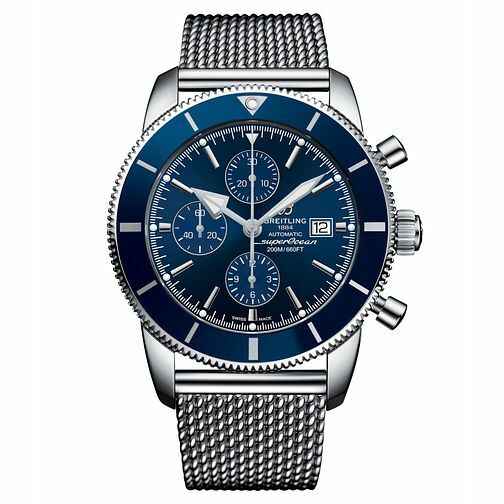 The Superocean Heritage II Chronographe diver's watch, is water resistant to 200 metres, and is styled with a stainless steel mesh bracelet and black unidirectional ratcheted rotating bezel. Its blue dial features date aperture at 3 o'clock, 12-hour counter at 6 o'clock, seconds sub-dial at 9 o'clock, 30-minute counter at 12 o'clock. Automatic Swiss made calibre 13, 25 jewels, power reserve of 42 hours.